Making a return to the show after a five year absence, Summat Colliery is a fictitious east midlands colliery layout set in 1958, towards the last days of BR steam. The colliery like so many in real life has evolved over the years and features many different styles of buildings reflecting the popular style at the time they were constructed. The name is derived from the name of a now long gone colliery at Kirkby-in-Ashfield, Summit Colliery and the local pronunciation of “something”. I like to think that it’s summat like a colliery! Modelled in 00 gauge using Peco code 75 track throughout, the layout is totally DCC controlled. The scenic sections of the layout measure 8′ by 2′ and incorporate a hidden sector plate under/behind the main screen building allowing empty wagons to be shunted off-scene and full ones to be returned to the exchange sidings. A further 4′ non-scenic sector plate/display section allows loaded coal trains to exit off stage and empty trains to arrive ready for loading. Points are operated by Peco solenoids controlled via the DCC handset using MERG accessory decoder boards connected to the DCC bus. 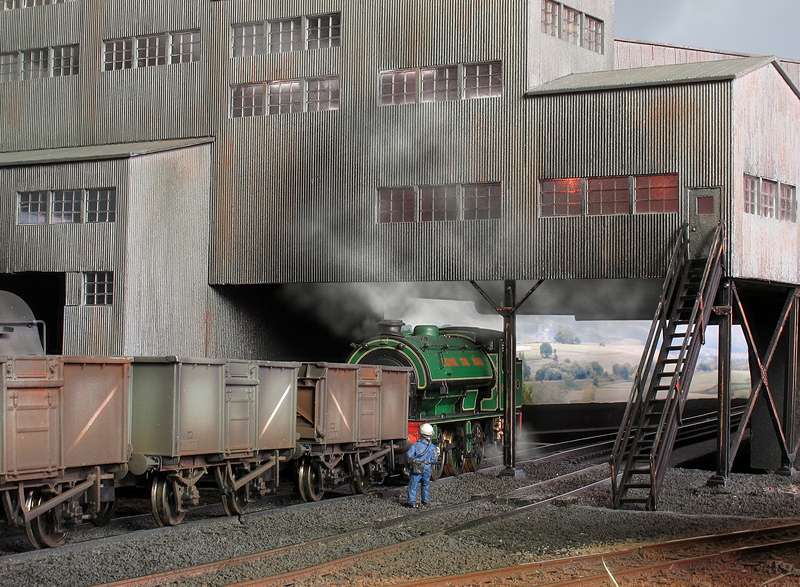 Day to day shunting duties are performed by Harry and #49 – austerity tank engines that despite their age are well cared for by the colliery staff. A variety of freight locomotives visit the colliery ranging from mighty 9Fs to more humble workhorses. Modernisation plan diesels also sometimes make an appearance. Watch out for the occasional surprise visitor to the colliery too! The atmosphere at the colliery is quite relaxed, the shunter leans against his cabin drinking tea and watching the squirrels. Other workers sit round the oil drum brazier and share a joke whilst two others hose down the area under the screens. Keen eyes will also spot the remains of someone’s bike, long since abandoned, rabbits, a badger and even a hedgehog. Lighting is provided for the shed staff and in the main buildings which comes into its own in less well lit venues.